YOU HAVE MISSED THE 41st FOLK FEAST! We sincerely thank everybody for their support. Sponsors, advertisers, concert attendeess, those who came just for the sesions etc. Without you none of it would have been possible. The dates for the 42nd Folk Feast will be announed soon. By Mike Dow, Publicity Officer. 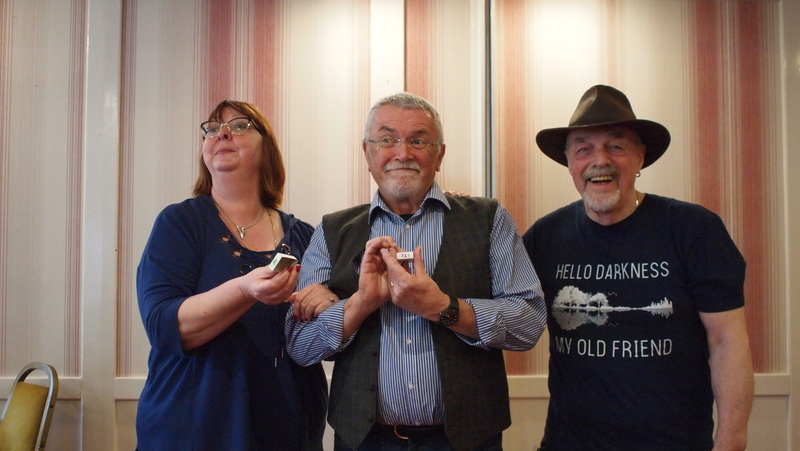 Over the weekend of 5th to 7th April, Glenfarg Folk Club held its 41st annual Folk Feast at the Green Hotel, Kinross, playing host to the best in traditional and contemporary folk and acoustic music. Guitars, fiddles, whistles and voice were in happy harmony throughout the weekend in an atmosphere reminiscent of the sixties and seventies, when 'folk' was perhaps at the height of its popularity. Folk music, however, is a broad church and has thankfully advanced from the days of unremittingly morbid ballads or simple 'three chord tricks' on thrashed guitars. Festivities began with a ceilidh-concert featuring the excellent Lomond Ceilidh Band with songs from Edinburgh-based Gill Bowman, a firm favourite of the Club. Saturday afternoons at the Feast are always good for a laugh when folk compete in the funniest original song contest-- this year, on the theme of 'New Beginnings'. 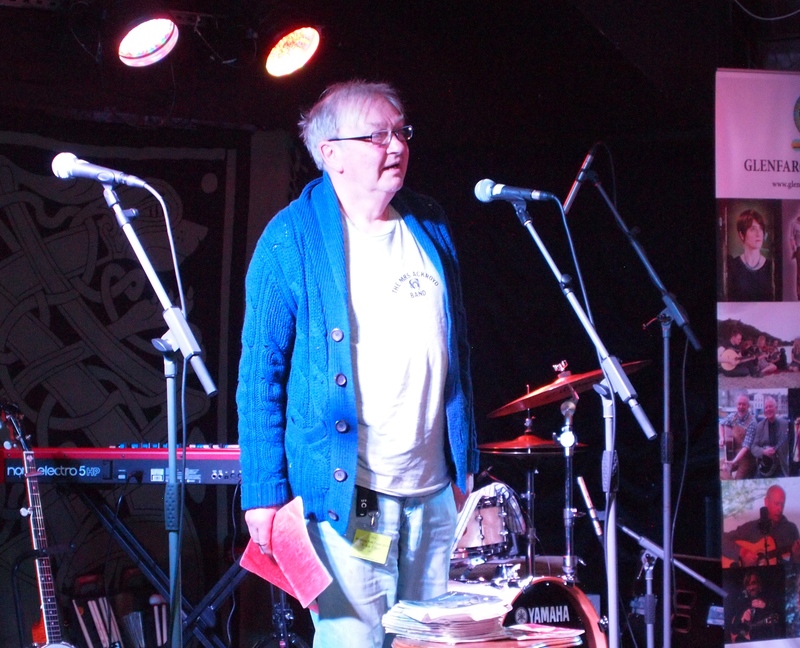 From a total of thirteen comic compositions, Malcolm Hughes' entry was deemed the most hilarious, and the £300 raised from the event went this year to the Teenage Cancer Trust. On Saturday evening 'Forgaitherin', a Fife-based quartet, opened the first of two concerts. 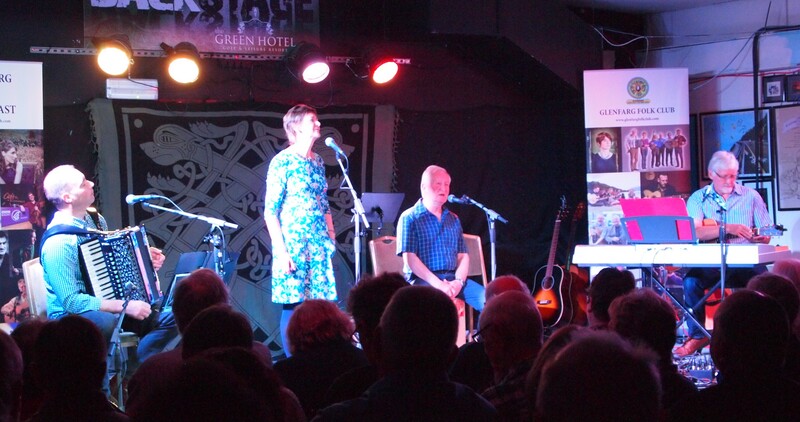 Hamish Grant and Lesley Toner led the line vocally in brilliant fashion with John Reid and Hugh Toner providing the excellent instrumentation that had the sell-out audience baying for more. Anthony Toner was next up, with a set that was nothing short of outstanding --- beautifully crafted songs, expertly played, in an absorbing performance with great craic. Fara, four young ladies from Orkney, brought the night to an end with their high octane fiddle music and driving piano. With an average age in the twenties, who said 'folk' was for old fogies? Their brilliant musicianship, engaging stage presence and enthusiasm have earned them numerous accolades---and no wonder. 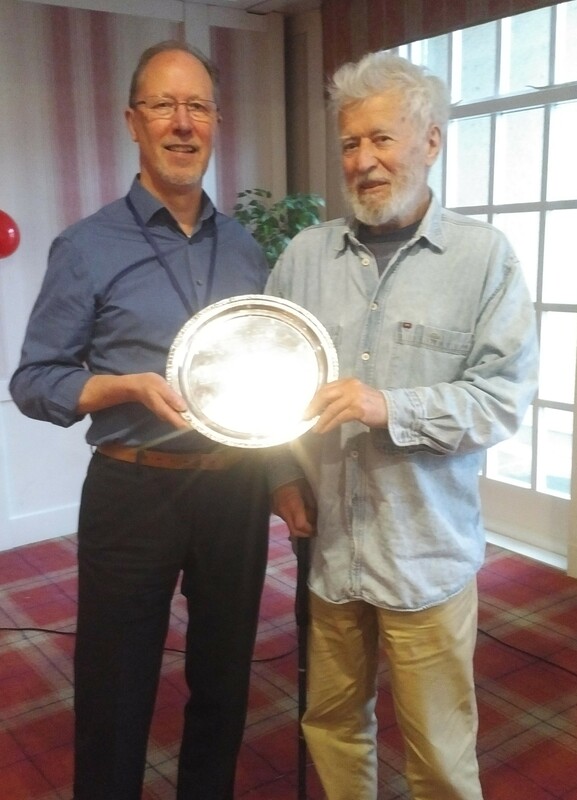 Another more recent feature in recent years has been the 'In Conversation With' event, with the spotlight last Sunday on Ian McCalman, who was invited to reminisce on his illustrious fifty years at the forefront of the folk music scene. Tales both poignant and humorous were inevitable and an hour seemed scarcely long enough. The World Puff-a-Box Championship attracted the usual large number of overinflated blowhards vying to propel the inner tray of an empty matchbox the farthest. With a blow of 5 metres 30cms, Bob McCarron, defending champion, showed again that he still has more puff than the Vital Spark. Meanwhile, as music and song filled most of the hotel and the nearby brewery, another capacity audience filled the hall for the Final Feast concert. The Ian Walker Band opened the evening show with great chorus songs, before the inimitable comedy genius that is Les Barker took the stage. His off-beat humour had the audience sore with laughter. He appears in the summer at Crail Festival and, for those who missed him this time round, it would be wise to get the date in the diary, if only to see this man in action. 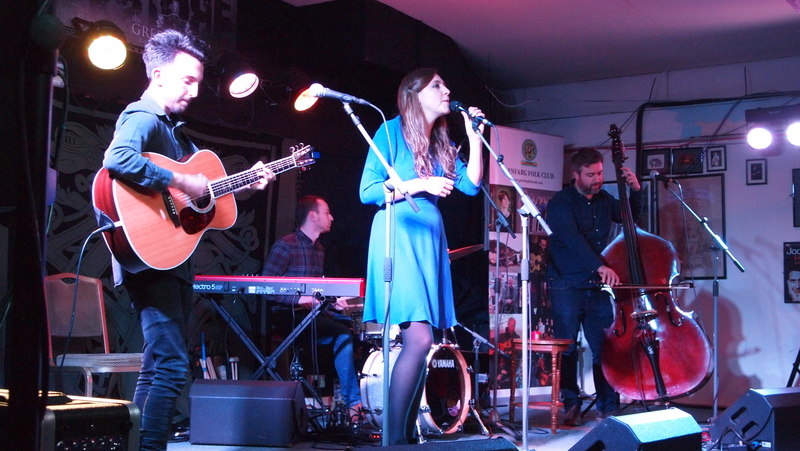 Siobhan Miller and her fabulous band were our final headline act and it became abundantly clear why she has been winner of the Scots Singer of the Year an unprecedented three times at the MG Alba Scots Trad Music Awards. Her polished performance was a fitting finale to a fabulous weekend. There is no doubt the popularity of the 'Feast', a 41 year old annual celebration of all that's good in traditional and contemporary acoustic music, remains undiminished. We have a dedicated FaceBook page especially for the Folk Feast. This is THE page for all things "Feast" related and will be the source for updates, news and chatter. One click on the logo will take you there. Please "like" our page.